Cute crouton coupon. Now say that ten times fast. I still get the newspaper every once in a while, and a few weeks ago I saw this ad among my coupon inserts. After reading the books, and watching the movies ad nauseaum, I wondered what that army of orcs had to eat while camped out at Gorgoroth. 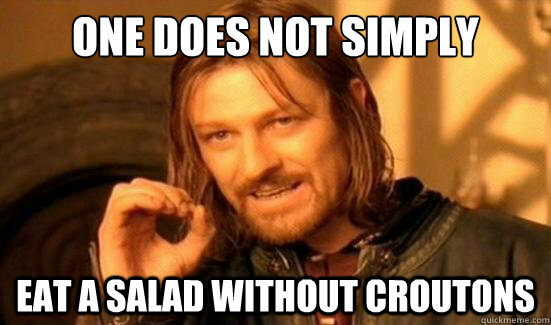 Now we know they took the croutons. It’s nice to see you posting again! And yeah, it’s hard to see the cowboy’s face. He could anything but a human and I wouldn’t notice. Thank you Daki. I’ve been thinking I might start collaging again, if I can arrange to have that sort of time to waste. Wow, two hugs from the Undersquid in two days! Welcome back from your desert island adventure. Yes, imagination is a wonderful thing. I wish it had been a desert island adventure! Then I’d have some tall t- er, true stories to relate.